The group of interest here is the third group. 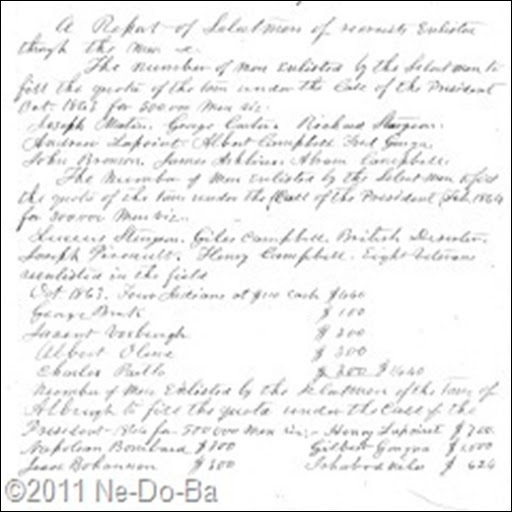 Seeing the actual document makes it very clear the “Four Indians” are not the same as the four named men (George Burk, Jacent Vosburgh, Albert Olena, & Charles Partlo) as has been suggested by others and by the published transcript shown below. This published transcript might lead someone to believe the four named men are the “Four Indians”. However, looking at the original, the “Four Indians” are each paid $110 for a total of $440. Then the 4 named men are listed with the amounts they were each paid and the amounts are totaled. Having the total provides additional confirmation the entry is for a total of 8 separate men, four of whom are not identified by name. So, if the named men (George Burk, Jacent Vosburgh, Albert Olena, & Charles Partlo) in this group are not the “Four Indians”, then just who were the “Four Indians” that served for the Town of Alburgh during the Civil War? I used ancestry.com, footnote.com, familysearch.org, and vermontcivilwar.org to determine the names of the men who were credited to the Town of Alburgh and to research those men further. I eliminated those who enlisted before the draft was instituted in July of 1863, those who enlisted after July of 1864, and those who are specifically named in the Alburgh record. This left me with a list of soldiers that should include the four unnamed men. If the list had turned out to be just four names long, my work would have ended there. Such is not the case for this researcher and so – now the fun begins! The following list of possible men is ordered by enlistment date and organized as name, date of enlistment, unit served in, followed by any other useful details I uncovered. I would love to hear from anyone that can provide more information for any of these men. Joseph Hodge, 26-Oct-1863, Co.H, 1st VT Cavalry, prisoner 2-Mar-1864, died at Andersonville 17-Dec-1864, b.abt. 1837, perhaps the man at Stowe in 1860 census b.abt.1837 MA s/o Levi & Mary Hodge. John Cormick, 8-Apr-1864, Co. F, 17th VT Infantry, b.abt.1828, no Cormick found in census and too many McCormick, no further research. One name on this list really stands out to me, that of Globe Amblo. As an “Indian” name, I would translate it to Claude Ambroise. The name Claude, as well as its common variations of Glode and Cloud are found in Wabanaki communities. A number of Wabanaki communities have no “r” sound in their language and so change it to “l” in speech. Charging the “l” in Amblo to “r” provides a reasonable translation for the surname. Based on name alone, I suspect this man could be Native American. Glode Amblo is found in Burlington in the 1860 Census, age 45 (he probably lied about his age to the recruiter), occupation is I think “Mouldin Factory”, born in Canada. He has a wife, Mary, age 42 also born in Canada. The oldest of his 7 children is 18 and all the children are born in VT. He filed for his pension from Canada in 1900. I place a high priority on acquiring his pension file from National Archives. Neither Mr. Amblo nor any family members are identified as Indian in the 1860 census. In fact, to date, I found no additional documentation for this man or the others on my list that identifies them as “Indian”. On the other hand, I found nothing at all for many of these men. By that I mean, outside of their Civil War service records many of these men don’t exist at all in other public documents! I am limited to what I can find on the internet, so I am asking for help. I’m sure these men did exist. If enough of us get involved and we (people that care about our veterans) look in the right places, we will find the additional information needed to solve this mystery. These three stand out on my list because they enlisted on the same date into the same unit. The date of their enlistment falls right in line with the dates of those named men (Burk, Vosburgh, Olena, & Partlo) in the 3rd group. But most important, the surnames are found in nearby Native communities a generation later. The three men enlisted in the 1st U.S. Sharpshooters. Peter was Killed in action while still with the unit. The other two were transferred into the 2nd Sharpshooters after a year. Then, as the war was coming to a close and the military was consolidating and reorganizing, they were transferred to Co. G of the 4th VT Infantry for the last 4 months of service. David Loren was promoted to full corporal less than a month from the time he mustered out on the 13th of July, 1865. I found a number of miscellaneous census entries for variations of these three names, but none looked very promising. I could not connect any of them from one census to the next or find additional information at the census locations. These soldiers could be in one of those entries I found, but there is not enough known about the soldiers or the men in the census to form any solid conclusions one way or another. I was able to rule out a David Laurin, b.abt. 1840 Canada. He went back and forth across the US/Canada border and can be followed through Census records on both sides of the border. He was the son of Joseph Laurin of Napierville, Quebec. David was registered for the draft at Plattsburg, NY in 1863, m. Adeline between 1863 and 1870, and is found in Burlington, VT directories dated 1883-1893. I did find each of the three surnames (Laffin, Loren, & Squires) at St. Regis in the early 1900s, including younger men named David Loren and George Squires. In the 1900 Federal Census young David Loren has his widowed mother, Sarah, with him. Sarah is also the name of the soldier’s widow. Could this young man be the son of the soldier? It certainly looks possible. Using just “Indian” records at Ancestry.com, the earliest I could find for the Loren surname was 1887 at St. Regis, the same family members were at Onondaga in 1888, then back at St. Regis. In these records they are documented as Iroquois and Mohawk. Unfortunately, St. Regis records for earlier periods are not available to me. In the 1900 Census, widow Sarah Loren has a birth date of Sep-1839, she has given birth to 8 children, 5 children are still living, she and both her parents were born in Canada, she immigrated to the U.S. about 1860, and she was a basket maker. This widow is the same age as the soldier and has the same given name as his widow. It is now a high priority to obtain the pension record from National Archives to see if it can provide confirmation. The Squires surname appears in the Federal Census at St. Regis in 1900 and 1930. I found a Lewis/Louis Squires with wife Theresa Philips. Louis was born about 1868 in NY and had a son named George Squires born in 1899. They are also found in other St. Regis records in the 1890s and the name is sometimes found as SQUARES in those records. I found almost nothing for the name Laflin and no McLaughlins that fit. However, while researching the other two names at St. Regis, I noticed a Laffin family there in 1930. So there appears to be a real possibility at least 3 of the “Four Indians” hired by Alburgh were Iroquois from New York. I have no connections in the Iroquois world of today, therefore I would be very grateful to anyone who could introduce this project to Iroquois folks with access to internal tribal records or a willingness to correspond with me (a non-Native person) about these men. Where to go from here? I think the most important step is to spread the word far and wide. The more people aware of this effort to identify Alburgh’s 4 unnamed Indian soldiers, the more chance of locating additional information or descendants. So please, anyone reading this, send a link to all your friends, “like” this blog entry, and do whatever you can to spread the word. Someone out there knows something of value or is in a position to locate additional documents. The current cost for a full pension file is $75.00 – beyond the reach of my current research budget. The second most important thing to move this research further is to help raise the $150 needed to acquire the pension files of David Loren and Globe Amblo. You can make a donation (tax deductible) using the paypal “Donate” button near the top of the right hand panel of this blog or snail mail to Ne-Do-Ba, %Nancy Lecompte, 1093 Main St., Lewiston, ME 04240. Please help me identify and honor Alburgh, Vermont’s “Four Indians” for their service during the Civil War. See the following posts for updates on this research project. These men have been identified by name. I am looking for information on this article. One of the men is my Great Great Grandfather ( Charles Henry Partlow ). A. LaBier. I am sorry but I don't understand what you are asking about. This is the article and there are two links in the yellowish box at the bottom of post that link to my follow up articles. I am not posting about your ancestor. My research has shown he is not being referred to in Alburgh town records as an Indian.